This special executive was called to consider the arrangements for Labour’s leadership and deputy-leadership elections. The meeting was v ery comradely and there was a serious intent to reach a consensus. Harriet Harman paid tribute to Ed Miliband for his unstinting commitment to our cause and to his dedicated leadership over five years. These sentiments were echoed all around the table. Everyone regretted that Ed was unable to be present for us to show the depth of our appreciation. Harriet stressed the importance of party unity and the need to conduct the elections in a comradely manner. This weas endordes by every speaker, with several (me included) drawing attention to the unacceptable criticisms and negativity from several senior party bigwigs who have rushed into print with ‘wise after the event’ diatribes. The executive will have a full discussion of the general election at our meeting next week. Our debt to our full time staff and all voluntary activists was put on record. There was no doubt that we out-organised on the ground. Iain McNicol reported that 30,000 new members have joined, bringing a total membership to 231,000. This is a very positive signal and Iain added that we are building on this through Contact Creator. The Scottish members of the executive in particular high lighted that we have not properly learnt the lessons of our failures since at least 2007 of how to counter the nationalists. I argued that if Labour loses touch with our working class base, we will not regain their support. I pointed out that our vote increased by 3.6% south of the border, but that the old adage that ‘government lose elections, oppositions don’t win them’ remains valid. Unfortunately not enough former Lib Dems and waverers see the government as having failed. Registered supporters: sign up on line and will asked to pay £3 as previously agreed for the London Mayoral election. In relation to affiliated supporters, it was accepted that many levy payers do not have emails and Iain McNicol undertook to ensure that satisfactory arrangement are made for them. The closing date for nominations of 10 June remains (UPDATE: but was later changed to 31 July) but the NPF and CAC all member ballot will take place alongside the leadership ballot and the same applies to the ballot for London Mayor. The NCC is elected by delegates at party conference. Councillors have eight seats on the NPF and Cllr Alice Perry pointed out that Labour Group secretaries have not yet been notified of this election and asked for an extended timetable. It was agreed that the closing date for nominations will be 31 July. This will oversee the leadership elections and is made up of NEC officers, Jon Ashworth, Ann Black and Jan Royall (Labour’s leader in the Lords). To be validly nominated, a candidate needs the support of 35 MPs (the PLP is 232). The ballot will be a preferential vote. Gender balance for these elections was raised, and it was acknowledged that unfortunately no rules are in place to properly facilitate this. Glenys Willmot raised the fact that MEPs are not able to make full nominations. It was accepted that the rules will be changed at a future party conference to facilitate this. These codes were agreed. Validly nominated candidates will receive lists of all voters and the secretaries of constituency parties and affiliates on payment of £2500, subject to guidance on data protection and limitations on the number of contacts (to keep them to a reasonable level). A cap on all cash expenditure, resources and donations in kind will be set, in line with the cap for the 2010 leadership election. At the end of the meeting, Ken Livingstone raised the issue of Tower Hamlets and the recent report from the election commissioner as a consequence of which NEC member Christine Shawcroft has been administratively suspended. He felt that this action was unjust and that the party should move on. Ken was supported by several trade union and CLP representatives (me included). It was pointed out that the electoral commissioner had made a damning critique of the way the NEC had treated Lutfur Rahman. Iain McNicol replied that the commissioner’s commment in relation to Christine was being investigated and if this proves not to be substantiated then that would be the end of the matter. Glenys Wilmott stressed that the NEC and the party needs an early discussion of the implications of the EU referendum which was agreed. But at just over 1% of the population – low by European standards – party membership is fast becoming a minority pursuit. There are more members of the Caravan Club, or the Royal Society for the Protection of Birds, than of all Britain’s political parties put together. The idea to give “greater public accountability” over the country’s 41 police forces met with abject voter apathy at the ballot box but the events in Rotherham over the past few weeks could change that. Shaun Wright was elected with a turnout of just 15% but, in a police area dominated by Labour councils, he took over half of the vote, (about 7%,) and walked into his £85,000-a-year job. 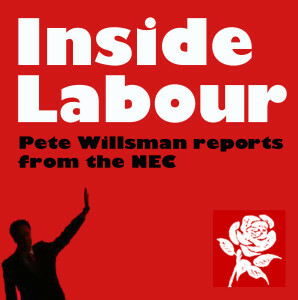 Peter, are you on the NEC replacing Kate Psamor, or Chritines, whiles she’s suspended? Pete is on replacing Kate Osamor because she became a MP. So he’s there till 2016. Congratulations Pete on getting to the NEC and congrats to Kate on her election as MP for Edmonton. Thanks to Peter Willsman for this report. However, I have problems with a number of points that he makes. (1) paying “tribute to Ed Miliband for his unstinting commitment to our cause” is all very well but the trouble with this sort of statement is that “our cause” in this context confuses the interests of the Labour Party with those of the deep social change that most of us on the left believe necessary. The latter is a cause that cannot be said to have been well served by limiting Labour objectives to creating “responsible capitalism”. (2) Conducting debated in a comradely manner is essential but I wonder about “drawing attention to the unacceptable criticisms and negativity from several senior party bigwigs who have rushed into print with ‘wise after the event’ diatribes”. I agree that the contributions from Umunna, Hunt, Mandelson et al have been as awful as one might expect. But does that mean that left-wing critics should not be, as many are doing, pointing to the reasons for Labour’s failure, albeit from a very different standpoint. (3) The Labour NEC has not in general distinguished itself by the excellence of its analyses so I rather resent the suggestion that we should wait for it to “have a full discussion of the general election at our meeting next week”. (4) “Our debt to our full time staff and all voluntary activists was put on record”. Hold on a mo’. Yes to the voluntary activists but it is my view that many full-time staff have played a less than positive role in terms of policy and election tactics. Some of the stuff coming out from HQ was an insult to one’s intelligence. (5) “The Scottish members of the executive in particular high lighted that we have not properly learnt the lessons of our failures since at least 2007 of how to counter the nationalists.” And those lessons are? (6) “I argued that if Labour loses touch with our working class base”. Can we have some precision about who exactly is encompassed in this base? Otherwise this sort of statement is virtually meaningless. (7) Does Peter Willsmon have a problem with date ordering? His time-line for the leadership election would suggest that this is so. The idea of a time-line is …. (8) Why are elections organised so that CLP full participation requires payment of £2500? (9) We are told that there was opposition to the suspension of Christine Shawcroft on the NEC but not about why the majority (apparently) supported it. I think that we should be told to position of each NEC member on this. I don’t think that it is enought to leave everything to Party bigwigs working out if “the commissioner’s comment in relation to Christine … proves not to be substantiated”. Apart from these problems I hope that members will take really seriously the issue of NPF elections. The NPF has allowed itself to be pushed around and manipulated. We need an NPF which is prepared to follow the logic of an argument however displeasing that might be to some. The CLP’s aren’t being required to pay anything. Ken’s a fine one to talk about TH. To clarify; on payment of £2,500 valid cands.get lists of voters and contact details for CLPs and affils. It is clear that the Commissioner was mistaken in his comment about CS,so the investigation will find no evidence and that will be the end of the matter. It was not specifically agreed at the NEC,but CLP Secs.have now been told that the closing date for nominations for CAC,NCC and all NPF Elections has been put back to 31st July.